"JMP - THE ONLY ONE"
Please note that shipping cost calculations are based on packaged weight which can be higher than the actual product weight. Possible discounts on total shipping costs for multiple unit orders; please contact sales department at sales@bigblueoceanmarine.com or by phone at 1 (250) 713-1018 for bulk order shipping quotes. Bulk orders are usually based on an order of 3 units or more. Possible discounts on total shipping costs for multiple unit orders; please contact sales department at sales@bigblueoceanmarine.com or phone 1 (250) 713-1018 for bulk orders. Bulk orders usually based on 3 units or more. 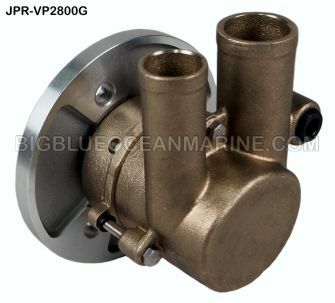 Click the button below to add the #JPR-VP2800G JMP Marine Volvo Penta Replacement Engine Cooling Pump (Replaces Volvo Penta 21212800, Johnson 10-13470-03) to your wish list.